Addressing transportation concerns requires the City of Austin and its partners to look for solutions beyond how we travel and begin dealing with underlying conditions that make it difficult for Austinites to move around the city. To do so, we need to coordinate the physical form of Austin — how it’s organized and how it is built with our transportation. When viewed as a coordinated planning framework, the Growth Concept Map, complete communities concept, Capital Improvement Program, small area and transportation master plans, and incentives for business attraction, retention, and expansion can work together to achieve the goal of a compact, connected Austin that is less car-dependent and more walking, bicycling, and transit- friendly. Corridor Program Office (Mike Trimble - Program Champion), Public Works, Planning and Zoning, Economic Development, Austin Transportation Department, Watershed Protection Department. For additional information about this priority program, see page 187 of Imagine Austin, or contact the Planning and Zoning Department liaison. Staff from contributing departments meets regularly as part of the Invest in Compact and Connected Priority Program Implementation Team. This team supports the work occurring under Priority Program 1 in various ways as identified in an annual work program. 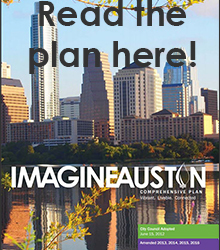 Since the adoption of Imagine Austin, the City of Austin has worked to implement the Invest in a Compact and Connected Austin prioirty program by aligning city departments and partners, developing detailed mobility and capital investment plans, funding capital investments that support the Imagine Austin vision, and partnering with the private sector to maximize implementation of the comprehensive plan.